With all this continued growth and expansion throughout the Valley of the Sun, it can become difficult to keep up with it all. That’s where we come in. Landiscor has remained committed to our client promise of visually communicating the ongoing changes across metro Phoenix through our Aerial Wall Mural product. The visually stunning Wall Mural Map is not just a unique branding tool for firms to showcase their knowledge and activity throughout the market, but it is also a compelling illustration of the city’s ongoing transformation. The 2019 Phoenix Aerial Wall Mural features over 125 updates from the previous year and is now available in an acrylic display! This new mounting design allows those clients with a more modern office look to have a Wall Mural that matches their décor. This sleek design still allows for the highly popular dry erase lamination feature to be added and is guaranteed to leave a lasting impression. 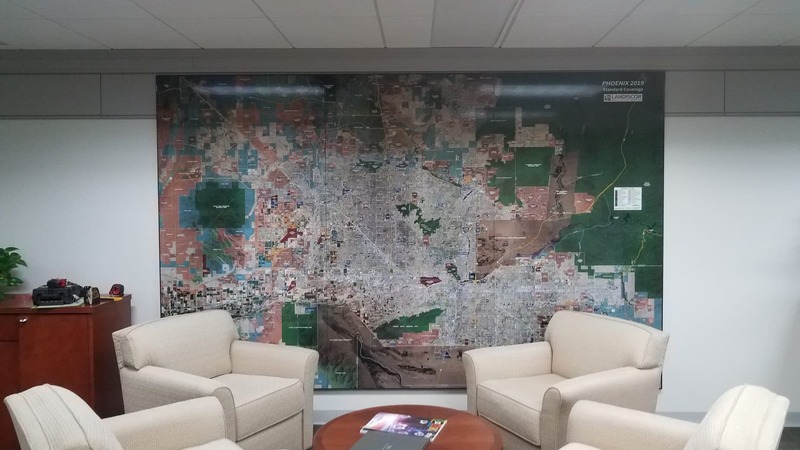 To learn more about our 2019 Phoenix Wall Mural or to speak to one of our very helpful mapping experts, please contact us at sales@landiscor.com. This entry was posted in 2019, Aerial Wall Mural and tagged aerial maps, aerial murals, mural maps, phoenix maps, rolled aerial maps, wall murals.